Little Seed Gardens CSA Shares available now! -You get a weekly newsletter to deepen your understanding of farming and the seasonal diet. Weekly recipes are included. -You expand your community. When you join a CSA, you enter a collaborative relationship with our farm family, and other members with shared values around food, health and nature. -You reduce impact on earth- locally grown, locally consumed food means saved mileage. -You help strengthen the local economy! 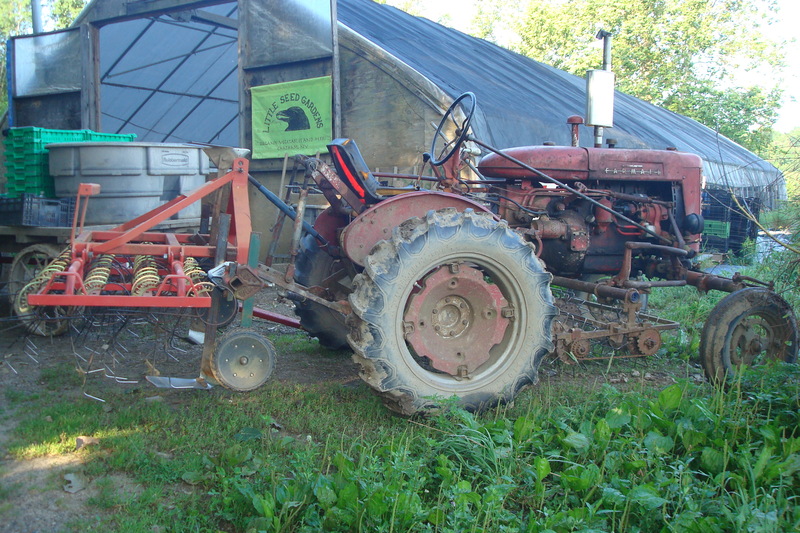 Small farms keep money in the community and preserve a rural landscape and rural life ways. visit us on Facebook to see the farm! I think when we act we are making our best attempt to meet our needs. We try to use what we’ve got to get what we want. I believe we try to make the best use of our resources to achieve happiness. We have ideas of our limits and try to get the greatest utility from our efforts. So why might someone go out of their way to come to the farmer’s market or CSA distribution instead of going to the grocery store where we often find ourselves looking for things that might be hard to get locally? For me there are so many needs met by eating local organic food that I have made my life out of it. Many of those needs are met immediately in the wellbeing of body, the connection to family friends and community and the pleasure of experiencing the thriving life of a place that come from that choice. But there is a less immediately rewarded need that many folks feel which is met by bothering over these things; contribution to life capacity of the place from which we meet our needs, contribution to soil. For me, the lasting gift to ourselves and to the life of the future, is one of the best reasons to choose to bother to support local organic agriculture. Preparing for a week of hot weather. We are into the heart of the season with warm weather crops ripening. Expect more summer squash, cucumbers, first eggplants. First tomatoes are starting to ripen but we don’t have enough yet to distribute. I think by next week we will be able to distribute first tomatoes. Beans soon. Peppers are coming along slowly, it will be a few more weeks before they appear in shares. Willy is working on making hay this week for winter feed for the cows. We usually just make one batch of hay per year, and the forecast this week looks good and dry. The crew is getting a good workout as harvests increase and pressure to get field work intensifies. At home, we have a spell of quiet time as visiting friends and family depart. If you get a chance please tour the gardens. We are falling a little behind on weeding due to all the perfect weed growing rains but things look pretty good despite this. Garlic is looking strong in the back corner of the farm. Our new herb garden is getting established nicely though it is also waiting for some weeding, but a better variety of herbs will be showing up in shares soon! Lots of rain. We are in the part of the season that feels like fast forward. 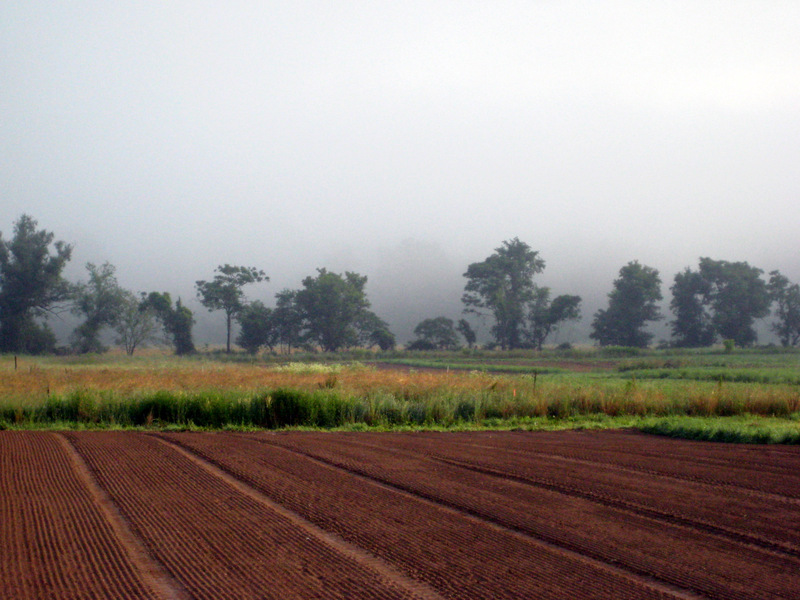 We go into the fields in the morning and they have been transformed. Seedlings seem to go from a seedling to a mature plant overnight. This rapid growth phase starts a few weeks before solstice and ends a few weeks after. The to do list has a similar rapid growth pattern this time of the year. The rain slows us down a bit. I strained my back and am having an opportunity to reflect and to attend to other, non physical aspects of the farm. In our nineteenth year of farming this work still provides a good challenge and lots of opportunity for learning to align ourselves with the natural cycles. Yesterday I attended a food safety webinar for vegetable farmers. I always learn something we can put into practice in these sessions. On the farm we strive for best practices and there is always something we can improve. While these seminars are useful, I am often surprised by content or lack thereof. It is shocking to me that sewage sludge can be applied to crops as a fertilizer, and that there is no waiting period required between application and harvest in the new proposed Food Safety Modernization Act. In addition nothing about GMO’s or chemical applications to crops are addressed in these “food safety” best practices. Warm welcomes to you all for the 2013 season! This is our 19th year farming. We grow about 15- 20 acres of certified organic vegetables and keep a small herd of rare breed Randall cattle which we sell for breeding stock. We love to have CSA members and farmer’s market customers visit the farm any Tuesday evening between 4 and 6:30 and please feel welcome to walk in the fields, ask questions etc. Most of our crew is back from last year. Our children, Otis (age 20) and Mae (age 14), will be helping out this summer along with some of their friends. Our greenhouse manager, Maria Gomez will in her 13th season here. Elia Gomez returns for her third season. Lauren Jones returns for her fourth season. Aliyah Brandt returns for her 3rd season and Jenny Parker, harvest and pack manager, her second season. With an experienced crew we anticipate a productive season. This year Willy is working to train Ruth and Sophie, our Suffolk horses, to make hay and silage for winter feed. Ruth’s new baby Henry gets hitched to the side of Ruth so he is also getting some early training. We are excited about this project and will keep you posted as things progress. Like us on Facebook for picture updates of the work horse project and all of our other projects too. The spring has been a little cool and dry to start so crops are coming in a little slowly. Beginning June shares consist of lots of green leafy vegetables. For those of you new to CSA it can take a little getting used to cooking with the share. Salads this time of year have a delicate flavor and I tend to use dressings very sparingly, if at all. Cooking greens are also in their most delicate adolescent phase and can be cooked just to wilt in the spring. Please check our blog for a recipe index (littleseedgardens.wordpress.com). I will also be sending out a few recipes each week and will try to introduce vegetables that may be more uncommon in the newsletters. If you have a recipe you love and want to share it with the Little Seed community please send it to me via email and I will post it on the blog! CSA share pick ups begin the first week in June. 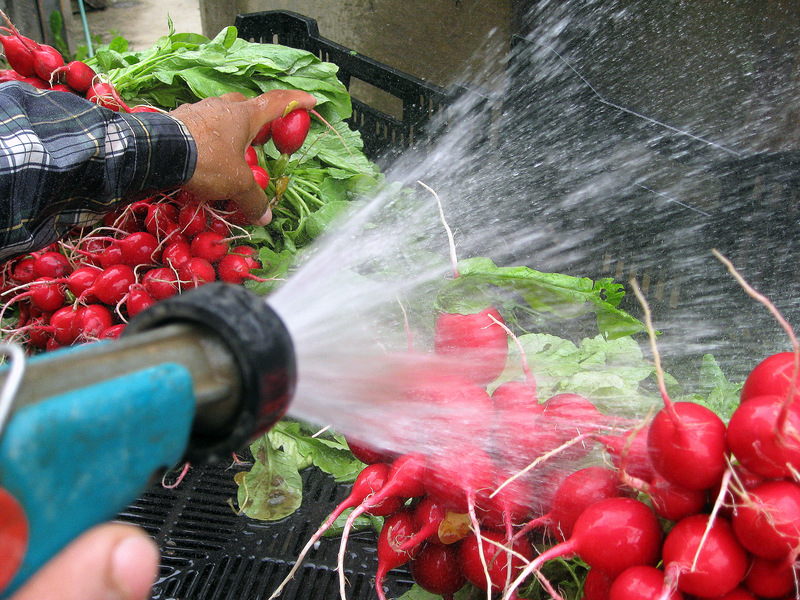 We are still accepting a few new members in our Chatham and Rhinebeck CSA. Come to the farm or the Rhinebeck Health Food store and pick up a weekly selection of luscious organic vegetables harvested that day, for you and your family. The season is 22 weeks ending in the last week of October. When you join a CSA you….